Quickstart package is a full website package that includes: templates, extensions, database, images ... and once you install the quickstart successfully, you will have a complete website that is exactly same as our Demo (in Quickstart, we use blank image due to copyrights). 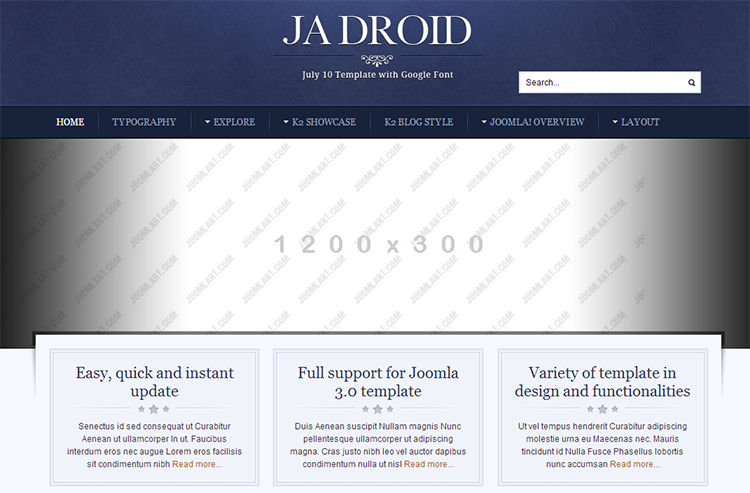 For each template, we provide multiple Quickstart packages based on its Joomla versions compatability. 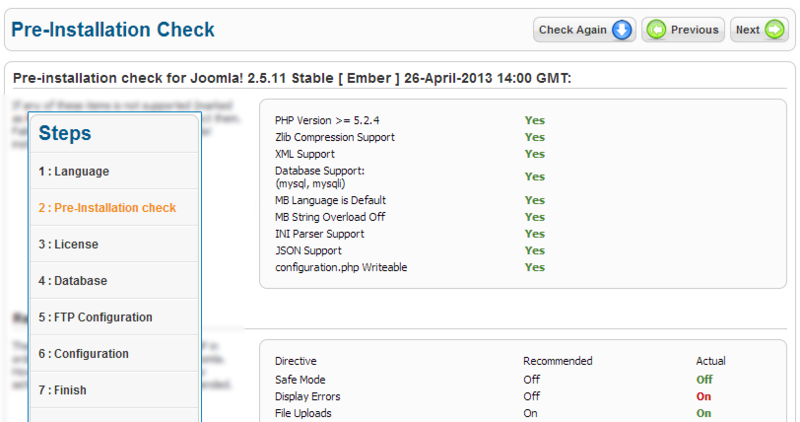 If a template is compatible with Joomla 2.5 and 3.x then each Joomla version will has a quickstart package. Once you have the Quickstart package, extract the downloaded package. 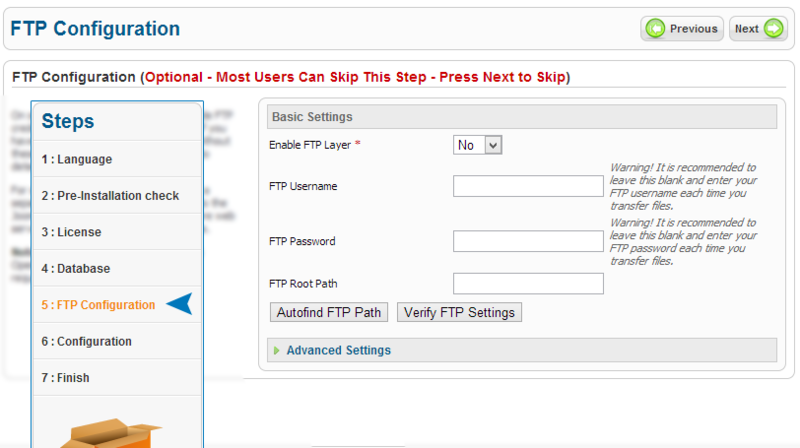 If you want to install the quickstart from your hosting, please upload all folders in the folder that you just extracted to the FTP Base folder (normally it is public_html). 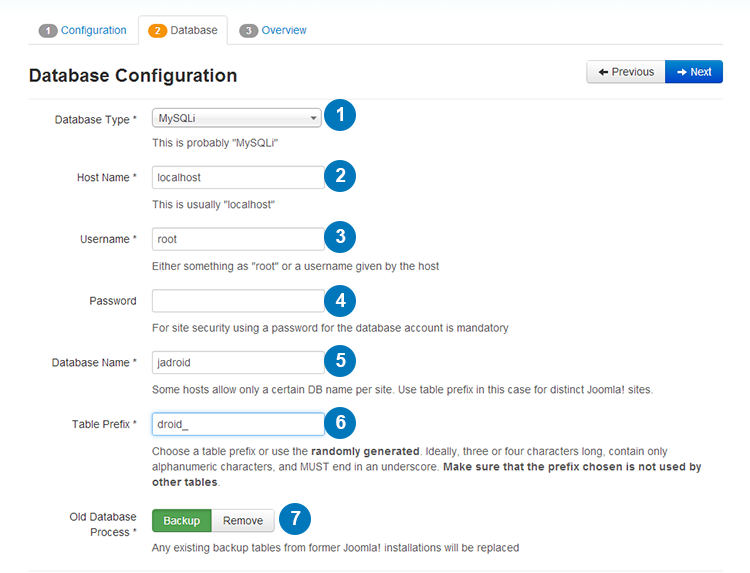 Access your database control panel to create new database. 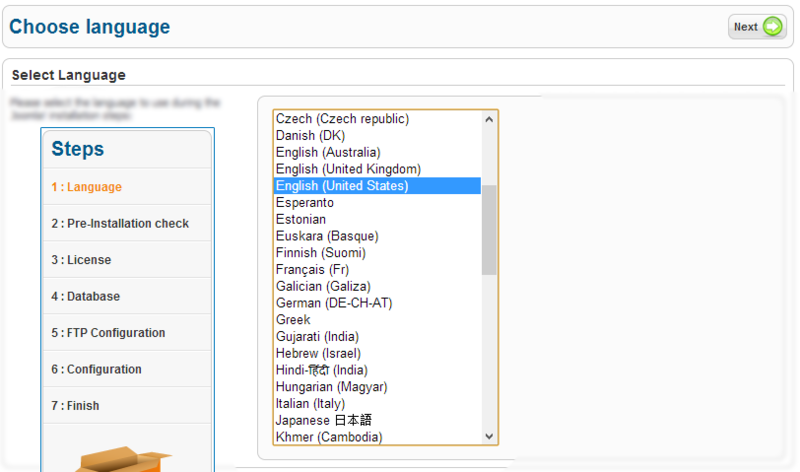 Select Language: as Joomla supports many languages, select the language that you want your website to be. Select your language for easy management. Site Name: enter your site name to the field. Admin Email: add the email of Administrator, you configure to send the configuration detail to the email. Admin Username: add the username of the Admin, this is the username to login the back-end panel as Super user so make user you remember the username. Admin Password: enter the password for the admin account. Confirm Admin Password: retype the admin password to confirm. 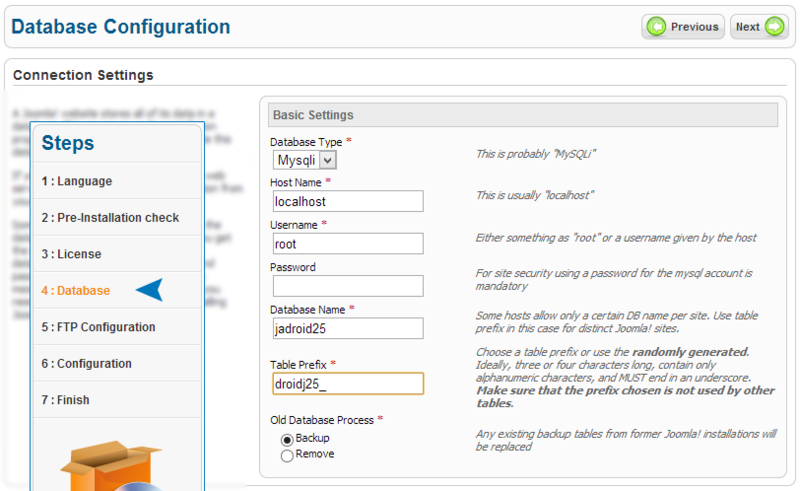 Database type: select the database type: MySQLi or MySQL. Hostname: enter your hostname in this field. In this example, we install in localhost so the hostname will be "localhost" but if you install from your hosting, you have to enter your hostname. Username: enter the username to access your host. Password: enter the password goes with the entered username to access your host. Database Name: paste the databse name that we created in Step 1. Table Prefix: enter the table prefix the the database name. Old database Process: If the databse we enter here is an existing database, we can select to back-up or remove the old database. After entering all required information, click "Next" to proceed with our installation. 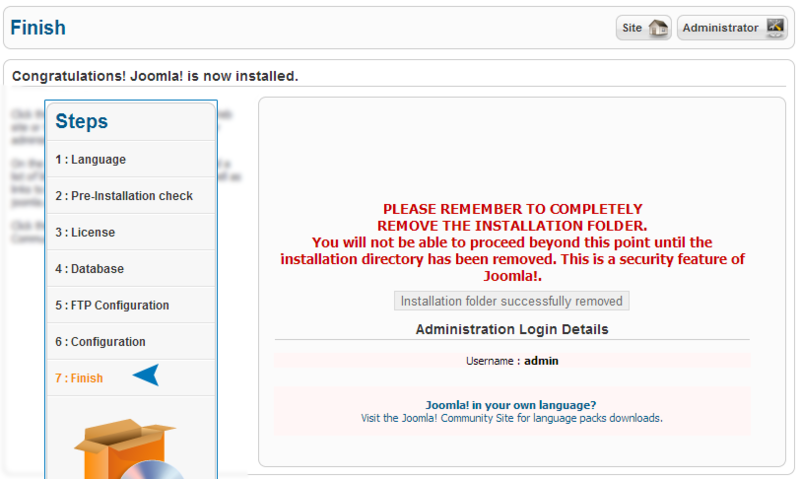 For our products, we remove all default sample data of Joomla, there is only one sample data in the list. Select the sample data so that you will have a site that look exactly same as our Demo site. 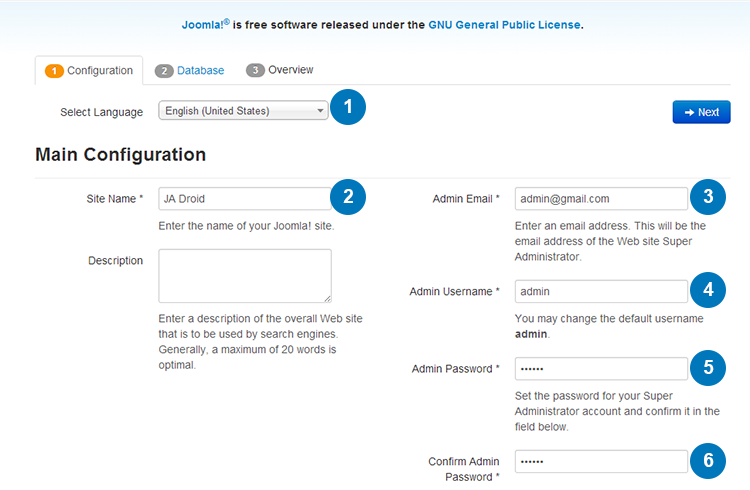 If you select "None", you will have a fresh joomla site. The next step is remove or rename the Installation folder for security purpose. Your front-page will be same our Demo site, only images are different. In release package, we have to use blank image due to copyrights. Joomla supports many language for ease of usage from users in different countries. Select the language that you prefer your site to be. In this step, you just need to view through the page to check whether all requirement is okay or not, if everything is okay, click on "Next" to proceed with the installation. 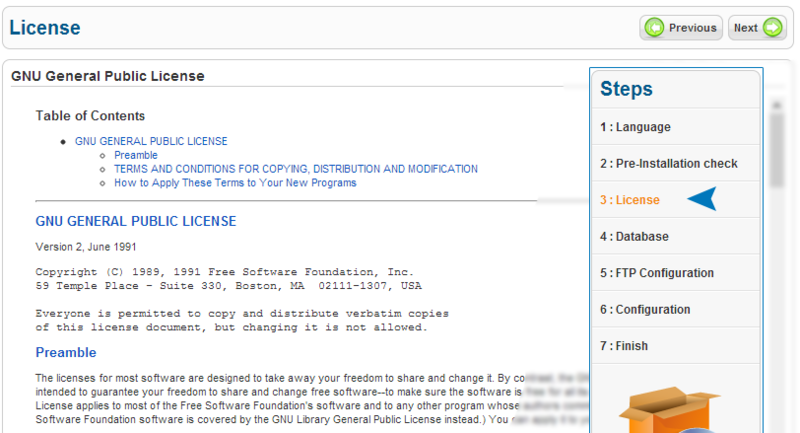 Joomla is free under GNU General Public license, to know more about it, please read the License page. This step is only applied when you install the package from your hosting, if you install in localhost, you can ignore this step. 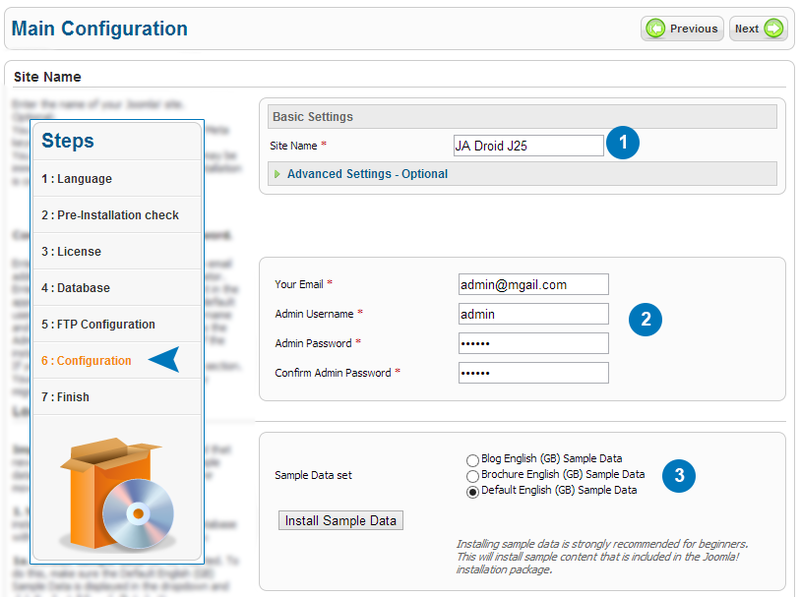 Sample data set: select the database that you want to install for your site then click on "Install Sample Data". This step is very important, please you select right sample data. You have to delete or rename the "installation" folder. It is required step. Once done, the installation is complete.